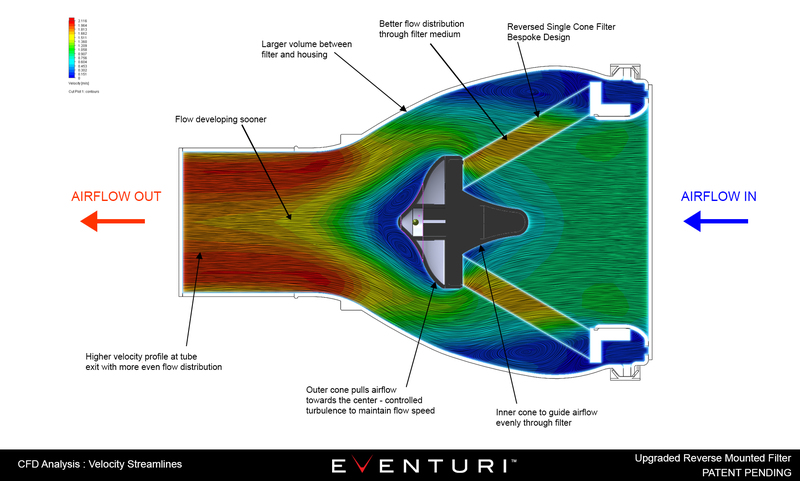 We are proud to announce Eventuri’s filter cones for 2018. 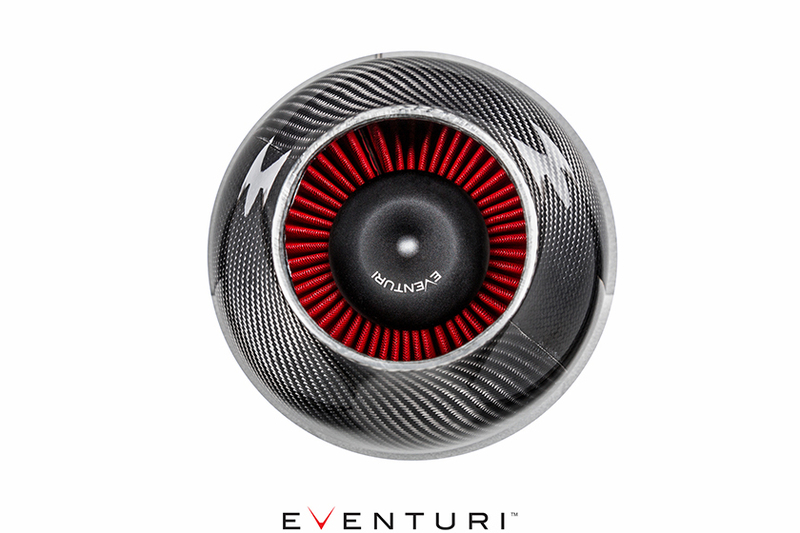 This filter is a custom design which was developed to provide optimum airflow through Eventuri’s housings where the filter is reverse mounted. 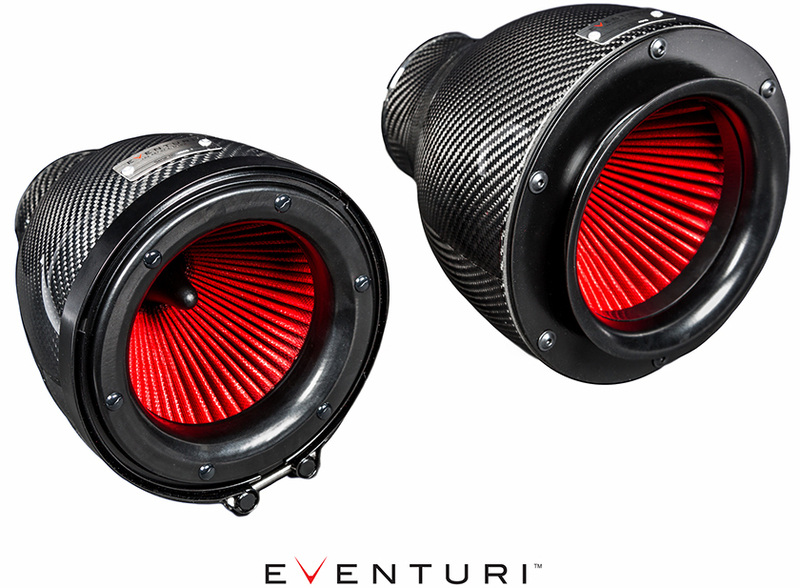 It is a direct replacement for all of their intakes which use Eventuri carbon housings and will be fitted to all new intakes from 2018. Internal Cone – designed to help direct incoming airflow through the filter and to create an even velocity profile across the length of the filtration material. This cone effectively helps airflow disperse across the filter without turbulence. External Cone – CNC machined, with a very unique profile, which was extensively optimised to help pull the airflow down to the center and transition smoothly into the downstream tubing. This cone creates a controlled region of turbulence around the tip which increases the convergence speed of the air, so that the connecting tubing has a higher velocity profile of airflow leading to the engine. The resulting flow through the filter and also smooth at the exit of the intake, to the connecting tube is smooth with a high velocity profile. In real terms, this means that the engine is able to draw air very efficiently, and the driver will be able to notice a sharper throttle response, as well as the power and torque improvements. Where the engine has a turbo(s) it will be able to achieve peak boost earlier as it will be working with less resistance. Tests have shown that our systems reduce the waste gate duty cycle by a significant percentage over the OEM system. The following diagrams are CFD simulations showing velocity streamlines through our system – with the new filter and the original filter. 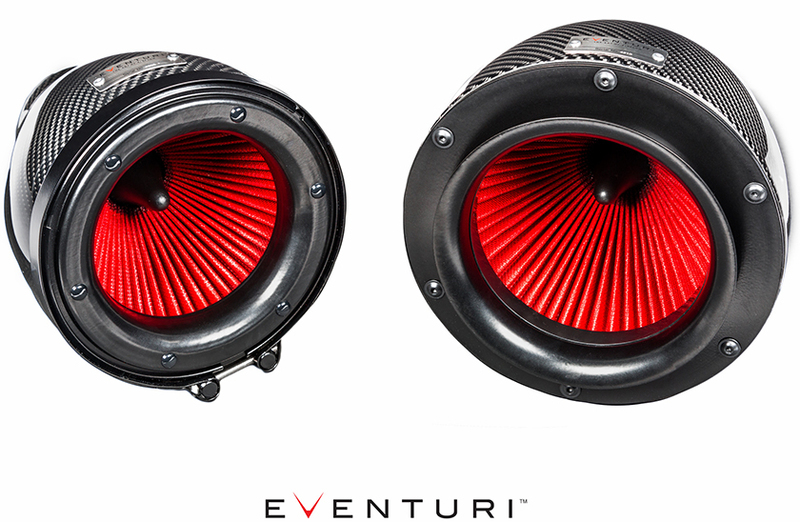 Through Dyno testing the Eventuri intakes back-to-back with the original filters vs the upgraded filters, we have found an additional power and torque gain. This validates our theoretical modelling and proves that the upgraded filters really have a significant impact on the airflow through the intake. The power gains over and above the original filters vary between vehicles, but here are some of the results Eventuri has measured so far. 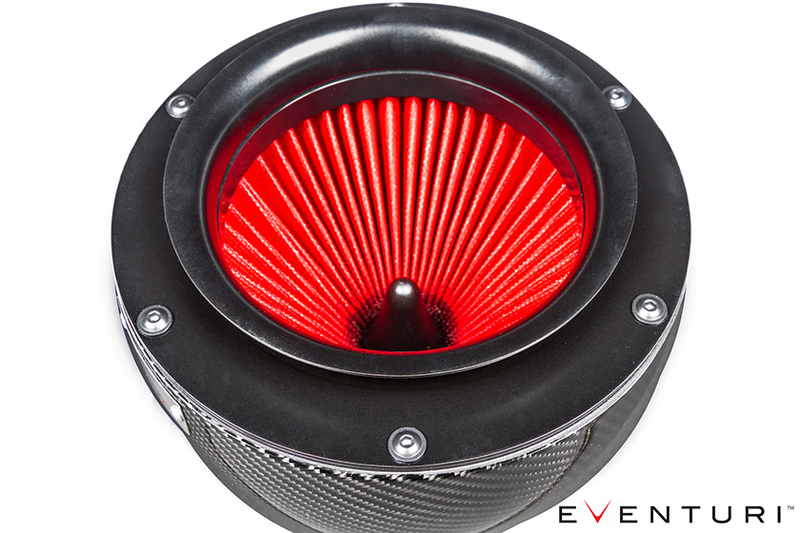 Please note – these graphs show the Eventuri intake with original filter vs upgraded filters. Not against the stock airboxes – which will now be an even larger gain! 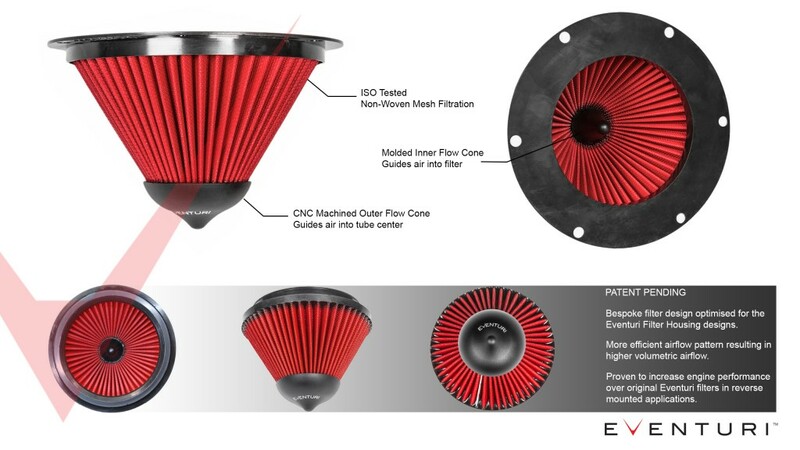 Aside from the technical improvements, the upgraded filters resemble the engines of an aircraft – resulting in a dynamic overall aesthetic once installed into the carbon housings. From the reverse – looking into the carbon housing – the laser etched outer cap is clearly visible surrounded by the filter mesh. An awe-inspiring sight.